The Space Saver with 2 Stools lives up to its name and is easily manueverable while on wheels. This cart comes with two stools that tuck away within the cart when not in use. A square drop leaf extends and is able to accommodates two people. 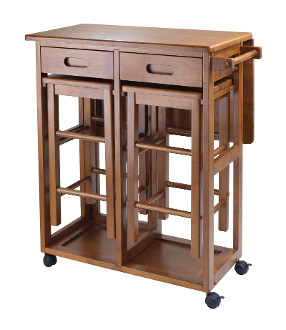 Use the cart in the kithen, dining room, or even family room as a dining arrangement or seating space. The stool's overall dimension is 11.4"W x 11.4"D x 20.8"H. When the dropleaf is folded, the cart measures 29.6"W x 15.4"D x 32.75"H with a table top dimension of 27.3"W x 14.8"D. Once the dropleaf is extended, the tabletop measure 27.3"W x 29.6"D. The unit is made of solid and composite wood in a teak finish. Assembly required. Table surface with dropleaf extended 27.3"W x 29.6"D. Table surface with drop leaf down is 27.3"W x 14.8"D.